Whatever the time of year, Mrs. Claus loves baking up a batch of her famous gingerbread cookies for the hardworking elves at the North Pole. Luckily, you don�t have to travel to the North Pole or even turn on the oven for a tasty cup of our Gingerbread Flavored Coffee. 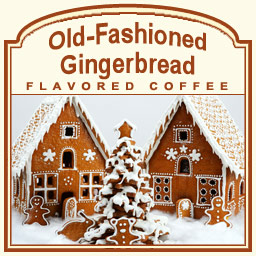 Whether enjoying a cup while the kids are opening their gifts around the tree, or reminiscing during the dog days of Summer, this delightful flavored coffee will make everyone�s spirits merry and bright.